Since Mommy is a slacker, it’s Daddy’s turn. Peas: Meh. She’ll eat them but not that enthused. Apples: OMG Yesyesyesyes. Please more now. 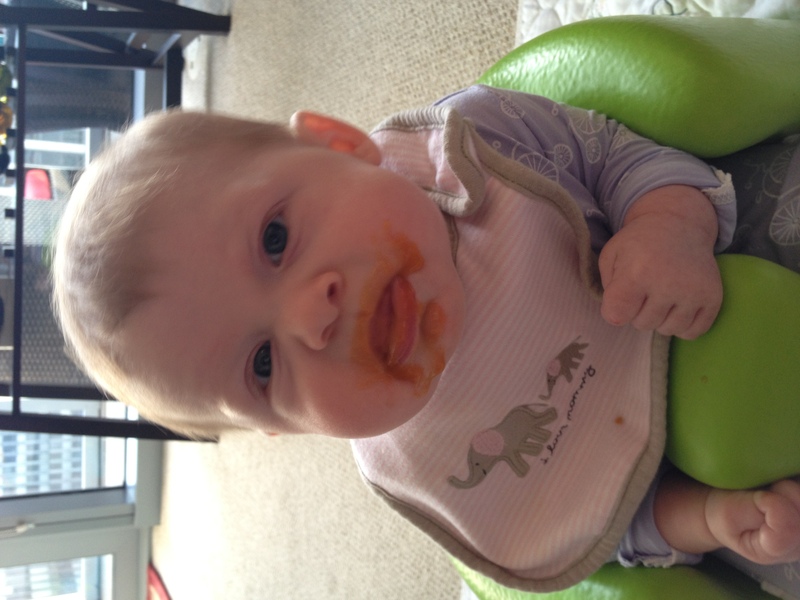 Sweet potatoes: Mostly positive. Don’t overdo it. Bananas (or Nanners in the Newman household): She’ll eat them but doesn’t go crazy like Apples and Pears. Green Beans: Green Beans are verboten for the near future. Remember the “beans, beans are good for your heart” song? Yes you do. Anyway, it’s real and it kept little Z up all night making noises from everywhere humans can make noises. And she was screaming. So yeah, this is a thumbs down. 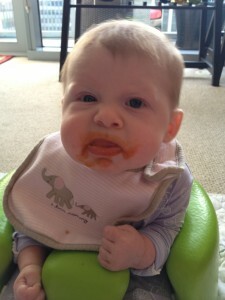 Carrots: She likes these but she has to be nakey nakey to eat these or they stain whatever she’s wearing. Bacon: Come on. I didn’t really feed her bacon…yet. This entry was posted in Favorite things, Food and drink by Dave. Bookmark the permalink. HA HILARIOUS! Bacon sounds good. 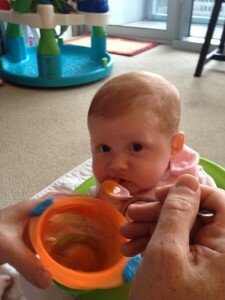 Rice cereal is so bland, but it’s a great source of iron so we mix it with other stuff to get Bea to eat it. Those Plum Organics/Ella’s stuff are so freaking expensive, but Vivi loves to drink things from pouches, so those are great, even for a three year old who is on the go and will eat more veggies if she can slurp them out of a pouch. Love the pictures–those are priceless. We also liked Ella’s Organics (they come in a pouch, like Plum Organics). I tended toward purchasing Earth’s Best, though, because their food has less sugar than a lot of the other brands. However, my child will eat anything that even remotely looks like food. And even some things that don’t. 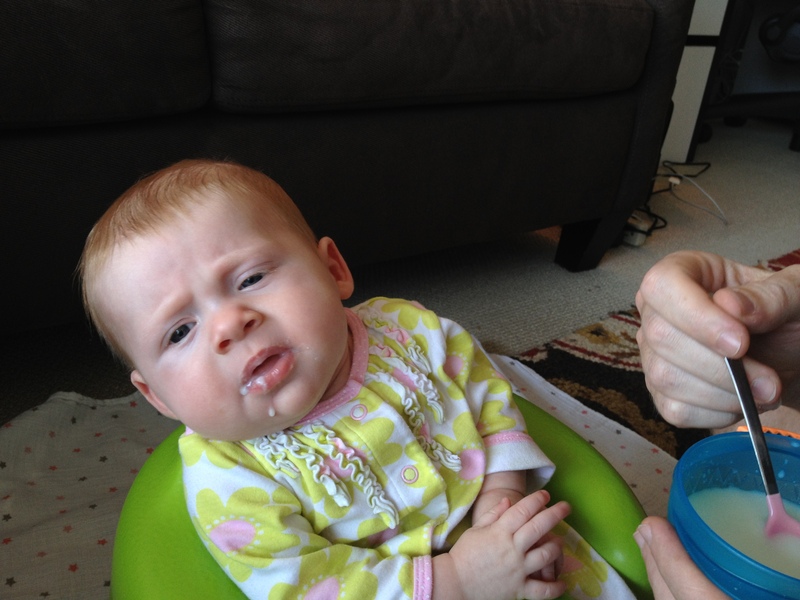 Rice Cereal just seemed like breast milk with a spoon to me. I think it did to Suzianne, too. BUT! We have not thought about mixing it in with other things. Great idea! 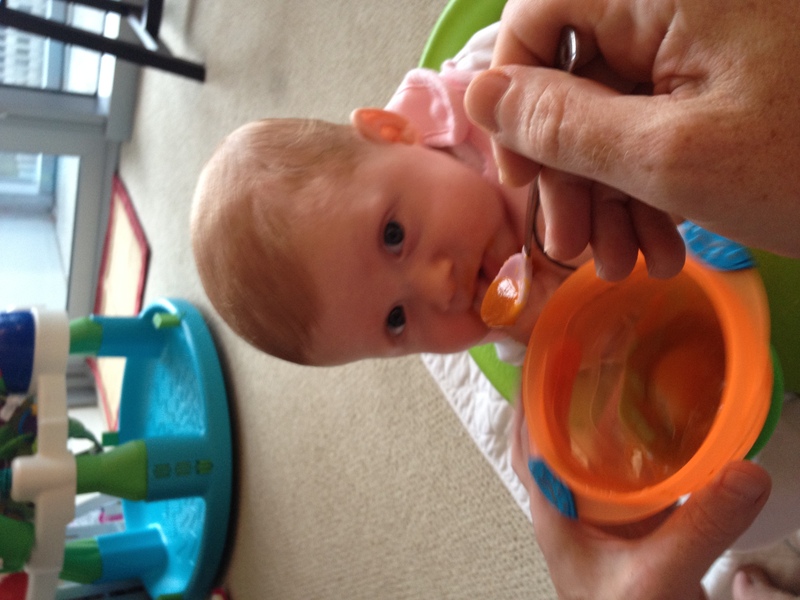 Belle was much more receptive to rice cereal when mixed with other food. One suggestion for another fruit to add to Suzianne’s list is mangos. They are Belle’s hands-down favorites. Plum Organics are our favorite brand…especially as we moved into stage 2/mixed foods…she knows the difference and is not a fan of mommy trying to save money.